Many of my foodie ohana are Peranakans, descendants of Chinese immigrants who settled in Malacca, Penang, Singapore and Indonesia and inter-married with local Malays. The old Malay word “nyonya”, a term of affection and respect for women in Peranakan culture, is now also widely used to refer to the cuisine of the Peranakans. And what a delicious, indelible cuisine this is! 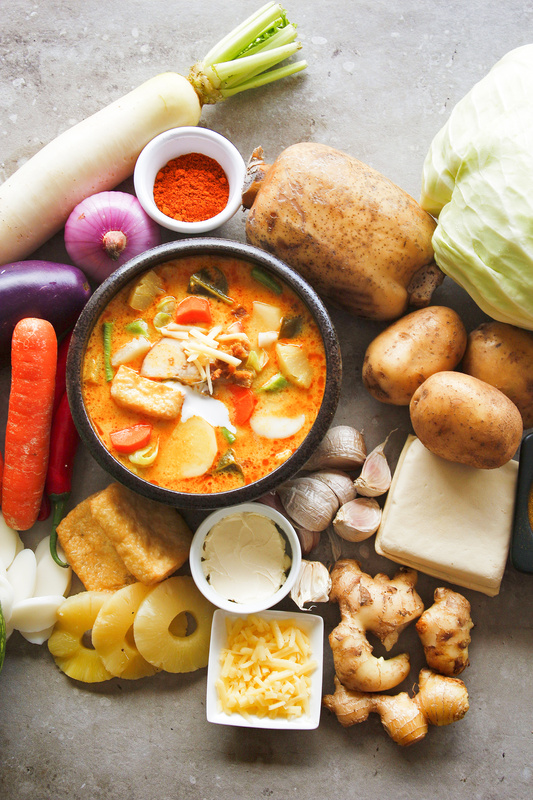 The many ingredients that go into this soup! Just like how Singapore’s story is a complex tale of assimilation, our food story is a corresponding exhilarating ride of cultural infusion. This National Day is a befitting occasion to remember the traditional and popular and mix things up a little! I’ve created this nyonya version of the traditional sayur lodeh, added pineapple to give it a refreshing tang, as well as cheddar and cream cheese for a natural umami taste and silky smooth texture. 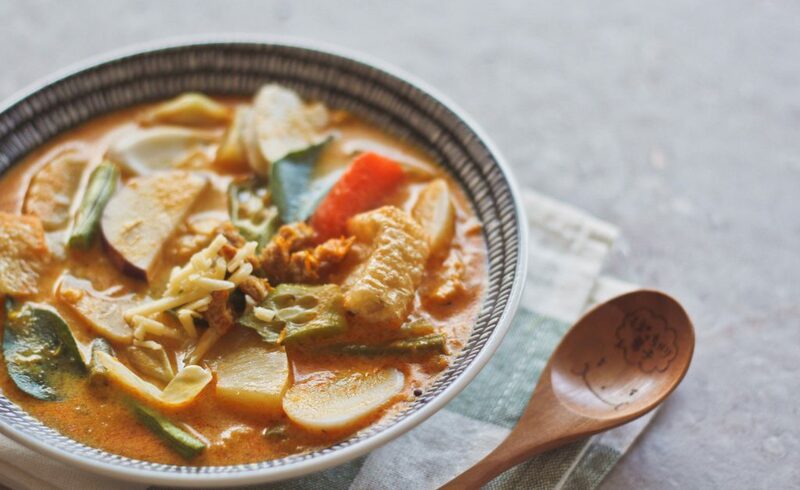 Instead of the traditional ketupat, you’ll find Korean rice cakes to make this a thick soup for a complete meal. 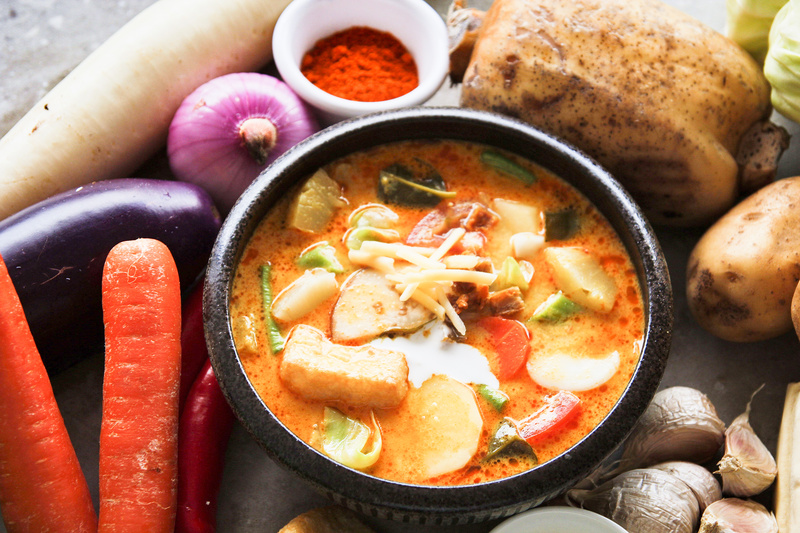 It’s familiarity and regional influences all in one alluring bowl of piping hot curry! Tada! Nyonya-Inspired Vegetable Curry with Cheese!